The McDonnell Douglas DC-10 is a medium- to long-range widebody airliner seating up to 380 passengers. The DC-10 emerged in the late 1960s as the first Douglas widebody airliner and it was the second widebody jet reaching operational status after the Boeing 747. Douglas was one of the losers in the USAF CX-HLS contest for a big military airlifter, which resulted in the Lockheed C-5A Galaxy. The company first tried to apply the knowledge gathered on the CX-HLS project to a design for a double-deck giant seating up to 600 passengers, but market research indicated that such a large airliner would not be necessary earlier than the mid-1970s. Furthermore, because of losses on the DC-8 and DC-9 programmes, Douglas was not in the right financial shape to bear the development costs of a big new airliner. The losses were even reason to offer the company for sale. It was McDonnell that took over Douglas in 1967 and made DC-8 and DC-9 production profitable. McDonnell was also willing to invest in the development of a new airliner. For this new airliner Douglas tried to fulfill specifications issued by American Airlines for a widebody aircraft smaller than the Boeing 747 and intended for domestic flights within the US. American first wanted a twin-engined aircraft, a so-called 'Twin Jumbo', but other airlines preferred a trijet. Although a twin promised the best economics, a three-engined aircraft offered better performance and less restrictions in low-visibility and hot-and-high conditions. A trijet was also more flexible for airlines flying long over-water sectors and had more power left in case of an engine-failure than a twinjet. American Airlines also changed its specifications to a trijet. After Douglas adapted its design, American ordered 25 DC-10 aircraft on February 19 1968. But after Lockheed gathered 144 orders and options for the competing L-1011 TriStar, it was far from certain that McDonnell Douglas could proceed with the DC-10. It needed an order from another big US airline, from United Airlines in particular. If United didn't choose the DC-10, the aircraft manufacturer would be forced to cancel the project. However, on April 26 1968 United decided to buy 30 DC-10s and took 30 options. The DC-10 could be launched. It is not surprising that the DC-10 and the TriStar, which are about the same size and were intended for the same markets, have much in common. The most visible difference is the engine position in the tail. Douglas put the engine in a straight duct in the lower part of the tail itself, while Lockheed chose for an elegant S-shaped duct on the TriStar. The position chosen by Douglas offered the advantage that only few modifications were necessary to install different engine types. The TriStar was available with only the Rolls-Royce RB.211. The first flight of the DC-10 was on August 29, 1970 and American Airlines introduced the airliner in service on August 5, 1971 on its Los Angeles - Chicago route. Because Douglas offered cargo, convertible and combi versions from the beginning, the DC-10 became soon more popular than the TriStar, which also suffered financial trouble and production delays. During the 1970s the DC-10 raised a lot of bad publicity. One of the reasons was a serious problem with the construction of the underfloor cargo doors. This was the cause of the crash of a THY Turkish Airlines DC-10 near Paris in March 1974. A cargo door opened in flight and 346 passengers and crew members died. There were several other major accidents with DC-10s. An engine separation during take-off from an American Airlines DC-10 in May 1979 resulted in grounding of the airliner for several weeks. The flight ban was lifted after it was found out that there was not a technical problem with the aircraft itself. The cause was that American Airlines followed maintenance methods which were not compliant with the manuals. American and also Continental Airlines used forklifts when removing and attaching engines. These practices resulted in cracks. The DC-10-10 was intended for domestic medium-range services, for example US coast-to-coast flights. This version is powered by General Electric CF6-engines. It has only two main undercarriage legs. 131 aircraft have been built. The DC-10-15 is a version of the DC-10-10 for hot-and-high airports like Mexico City. The main customers were Mexicana and Aeromexico. It entered service in 1981. Only seven aircraft were produced. The DC-10-30 was designed for intercontinental long-range routes and powered by General Electric CF6-engines. With more than 200 built this was the most popular DC-10 version. It was also available as freighter and convertible. The DC-10-30 has higher weights, a bigger wingspan and more fuel capacity. To carry the extra weight a third main undercarriage leg with two wheels was added. 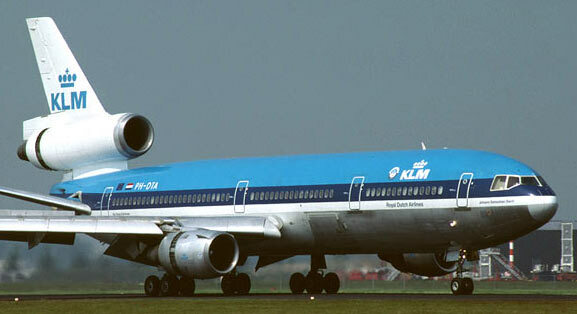 KLM was the first airline to put the passenger version of the DC-10-30 in service. The DC-10-40 is identical to the DC-10-30, apart from the engines. The DC-10-40 is powered by Pratt & Whitney JT9D Engines. The version was specially developed for Northwest Airlines. The only other customer was Japan Airlines. 42 aircraft have been built. The KC-10 Extender is the military tanker and transport variant in service with the US Air Force. Including 60 Extenders a total of 446 DC-10 aircraft has been built. In the early 1970s McDonnell Douglas considered a short-fuselage, twin-engined derivative of the DC-10, the 'DC-10 Twin', with a range of 4000 km (2160 nm) and 236 seats. McDonnell Douglas targeted an in-service date in 1975, but in the end considered the twin a danger for its own DC-10-10 trijet, and didn't develop it. The twin was renamed DC-X-200 later. The history of widebody aircraft might look quite different if McDonnell Douglas had decided on producing this aircraft, because it would have been a main competitor for the Airbus A300. In the late 1970s MDC hardly sold any DC-10-10s any more, and Airbus won most orders for short-haul widebody airliners. Later DC-10-based twinjet proposals also didn't materialise. Although McDonnell Douglas was a master in stretching aircraft like the DC-8 and DC-9 and although it considered lengthened versions of the DC-10 from the beginning, it never did so until it launched the MD-11 in 1986. The DC-10 was quite fit for stretches. It was rather high on its wheels to allow a stretch of more than 12 meter (40 ft) without the risk of tail-scraping on take-off. But in the mid-1970s the airlines were not interested in longer DC-10s because of the oil crisis and the economic recession. In 1979 Douglas published details of the so-called DC-10 Series 61, 62 and 63, designated analogous to the earlier DC-8 stretches. The 61 and 63 would have the full 12,2 m (40 ft) stretch and the 62 a moderate stretch of 8.14 m. (26.7 ft). The 61 would use the basic DC-10-30 wing and the 62 and 63 would have an extended and improved wing. Because of the higher weights the DC-10-62 and -63 would also have a four-wheel main centre landing gear instead of the two-wheel leg of the DC-10-30/40. These versions weren't built however. Late in 1982 McDonnell Douglas changed the 'DC'-designation to 'MD' and in 1985 the company considered a stretched DC-10 as MD-11X, with a 6.78 m (22ft 4 in) longer fuselage. 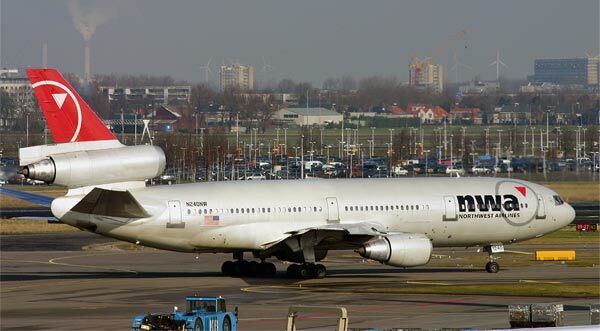 This proposal became the later MD-11. The DC-10 is almost forty years in service now and almost all aircraft still in operation are flying cargo services. The DC-10 became, more than the TriStar, popular as a freighter. But its numbers are dwindling. Today's biggest user of freighter aircraft is Federal Express.